Xilitla, Mexico — Las Pozas is truly one of the hidden wonders of 20th-century Mexico. Located in the lush rain forest of the isolated Huasteca Potosina region of San Luis Potosi state, this remarkable surrealistic sculpture garden was created by Edward James, an eccentric British poet, nature lover, and art patron. Between 1949 and 1984, James built 36 fantastical concrete sculptures in an 80-acre parcel of jungle near the mountain town of Xilitla. Born in 1907 into extreme wealth, young Edward James lived a life of privilege. He was brought up on 6000-acre West Dean Estate in West Essex and attended Eton and Oxford. James later mingled with London high-society and embraced the literary and art worlds of his time. After a failed marriage to dancer Tilly Losch, James moved to Europe where he befriended Salvador Dali, Magritte and other members of the nascent surrealist movement. Knowing a good thing when he saw it, Edward James amassed a large collection of surrealist paintings, which he later sold to finance the construction of his own artistic fantasies at Las Pozas. Today, a visit to Las Pozas offers a walk through a fairytale world of giant bamboo-shaped columns surmounted by concrete flowers, and half-finished cement towers sprouting leafy motifs and tentacles of rusted rebar. Precarious spiral staircases ascend to the open sky, and narrow bridges lead to pristine waterfalls tumbling through the trees. Surprises await at each turn in the winding path: faded yellow and blue Gothic arches clinging to weathered facades, stone walls with eye-shaped peepholes surveying the greenery, and giant fleurs de lys sculptures blooming in the tangled undergrowth. Edward James died in 1984, leaving Las Pozas in the care of his longtime friend and construction supervisor Plutarco Gastelum. 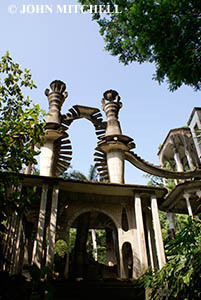 In 2007, the Gastelum family sold Las Pozas to Fondo Xilitla, a nonprofit organization established to preserve and repair Las Pozas’ sculptures, which are slowly being devoured by the jungle. Like a true surrealist, Edward James felt that his home should never be finished, so it is only fitting that Fondo Xilitla is planning to pick up where James left off. GETTING THERE: Xilitla is situated about 350 kms (220 miles) southeast of the city of San Luis Potosi. There is frequent first-class bus service from San Luis Potosi (via Ciudad Valles) to Xilitla. The most interesting place to stay in Xilitla is the Posada El Castillo, Edward James’ former home and something of a surrealist fantasy itself. An attractive alternative is the Hostal del Cafe, a welcoming small hotel set in a patch of tropical jungle only a few minutes walk from downtown Xilitla. Las Pozas lies three km (two miles) north of Xilita. Admission is about US$3.00. Opening hours are daily from 9am until 6pm. Click on the images in the slideshow below to see purchasing and licensing details.